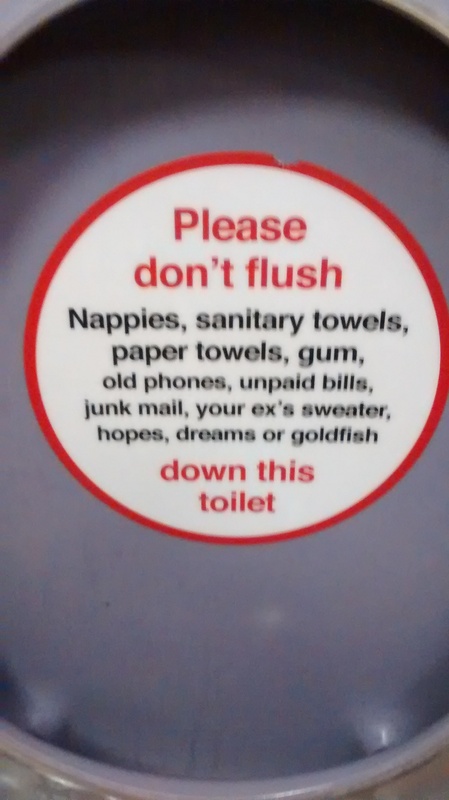 This is the lid of a toilet on a Virgin train. The same message was also being played in audio in the toilet cubicle. When I came across it yesterday I was trying to work out exactly what creeped me out about Corporate Cute. There’s a lot of it around now. The first example of it I remember was the cuteness overload of Innocent smoothies, who even sell some bottles with woolly hats to go with the cloying slogans. Since then it seems to have spread everywhere, and its arrival at a train company seems to signal that even ‘serious’ companies now feel free to be cute. One reason for the creepiness of Corporate Cute is undoubtedly, as a friend pointed out, that some faceless behemoth of a company that wouldn’t give a toss if you died in a housefire tomorrow is pretending to be all chummy with you. ‘We’re just like you,’ they lie. Companies don’t behave like people, unless those people are psychopaths. But I wonder if there’s something worse to it than that. This Corporate Cute is the repackaging of a wave of cuteness across society, ranging from cat cute on the internet, to cute signs outside cafes and pubs, to appreciation by adults of cute childrens tv programs. I admit I indulged in it myself a few years ago, but over time I became increasingly suspicous of it. It seemed to me to signal a deliberate refusal of adulthood in favour of childhood. Now there are some good reasons you might do that, if for instance you associate childhood with openness and creativity, but the implicit statement here is that adulthood is boring and rubbish. There are no good sides to adulthood to make up for what we lose with the loss of childhood. Politically this sets my sirens blaring. Because the big benefit of adulthood should be increased control over your own life. So I can’t help wondering if people of my generation and younger have noticed that they aren’t going to have as much control as they might want. Their wages are dropping, self-controlled housing is ebbing away, and as an adult you enter into a highly managed society. Even if you are a manager yourself, with a commensurate wage, what you manage is some highly specialised area in great detail, while the rest of your life is managed for you. You are offered a range of choices by large corporations, but if what you want is none of those things, life will be quite difficult for you. What are the benefits of adulthood right now? A bit more money perhaps, but that doesn’t necessarily amount to increased control over your life. Enter Corporate Cute. You have noticed that adult life is crap, says the corporation. We won’t admit our role in that. We’ll just repackage your symptoms back to you to help us sell things. We can’t give you what you want (unless you want Phone A or Phone B) but we can help infantilise you, in response to your own desire for escapism. There’s one thing you can’t escape: our grip on your life.